The forecast for Sunday 7 December wasn’t too bad, so we loaded the B and headed off to the Boys Brigade camp at Foxton beach. Unfortunately we were a little late, but found a couple of spaces by Anne and John Ireland. Soon after, the Barbeque was fired up and well driven by John Edwards and Brian our Treasurer. There was plenty for everybody, a piece of steak and a sausy, finished off with one of the numerous salads. Just as we were finishing, the damn rain started, so it was a quick pack-up, and a dash for the hall where most of us grabbed a tea or coffee, and continued our chin-wagging!. Before long Father Christmas and his little helper were distributing the gifts to the Females and Males present. This included a number of new members: Larry and Diane along with Heather and Neil. Hopefully this will be the first of many expeditions and gatherings that we’ll see them at! John Eames called for a bit of quiet and he gave a quick summary of the year, and a quicker talk about the forthcoming year. John also spoke of the communication problems we had experienced on the Mahia trip, and after a show of hands it was agreed that John Ireland purchase a pair of professional walkie-talkies. Another great day to finish another great MG year! Friday morning found 14 MG's and 24 excited crew lined up at 'Awastone' by the river at Mangaweka for morning tea. Fully fueled up on sandwiches and sausage rolls and then petrol in Taihape we were off to Napier over Gentle Annie into sunny Hawkes Bay. Always one of the great drives. Bruce McConnon met us near Napier in his B and led us to his and Sue's lovely home for lunch. Much appreciated Bruce and Sue. A nice afternoon run to Wairoa followed and at 5.30 we made Mahia Beach to settle in to our three beach houses. Takeaways for tea from the local busy tavern almost turned into takeaways for breakfast for some, but that's another story. Saturday morning saw us away early to Tiniroto on the lovely inland route to Gisborne. Sadly, Keith had decided that the Midget being all 'go' and ﻿not always enough 'stop' wasn't satisfactory so headed quietly home. In spite of some anxious moments dealing with two flat tyres we made it to a magnificent morning tea laid on by Tiniroto School. On then through to Gisborne for a free-time look around, and socialising with enthusiastic local MG owners, including a photo shoot for the local paper. Back down the Pacific Coast Highway we visited Morere Hot Springs where three pools offering 'rare', ' medium' or 'well done' were good fun. A social evening followed at Mahia tavern with entertainment managed by Quizmaster Bryan. From there it was unfortunately au revoir to Tony and Clare, leaving early morning for family commitments. Sunday morning offered time for some exploring of the Pacific coast before lining up on the waterfront for photos and leaving at 10.30 for Tutira. A superb lunch was laid on there by the school and some sporty spins around the sports field provided for locals. Unfortunately a further au revoir there to Neil and Liz and Robert (work grrrr..) before the cruise down to Napier and our various accommodations. At 6.30 twenty members gathered at the RSA for a sumptuous farewell dinner. Monday dawned finer than ever and the ranks thinned to ten for the tractor and trailer beach excursion to Cape Kidnappers. A beautiful day gave most their first bit of suntan for the year. A long fine warm evening run home was a satisfying finale. We eccentrics tend to partially measure the success of trips by top-down content. Blessed with almost totally dry and warm conditions, these four days scored 100%. But the social side is the real measure and who wouldn't rate that 100% ? Sincere thanks to all participants, including dedicated 'tail-end Rachel' there when your tyre goes down, busy photographer Robert, and entertainer and astute treasurer Bryan. Now, where shall we go next? Sunday October 19th, not the greatest weather-wise but 13 cars and crews assembled at the Feilding Railway Station for a run to the wind farm. Welcome to Denise Garner and friend Delina in a red MGF. The quiz part ofthe run was changed to 13 questions on MG matters (optional). At the appointed time we set sail for Ashhurst via Taonui and Hiwinui wherewe met John Edwards in his van as “Bluebee” is out of action. Met our son Mike at the bottom gate to the farm and then a steep drive up to the farm itself. Cloud, rain and strong winds meant no sweeping views at the top so we went into the main building where Mike gave a presentation on the workings of the farm. Surprising just how much weight is sitting on top of those tall towers. Back down the hill to Ashhurst and lunch at the Domain in a handy shelter building and then off up the Pohangina valley to the Cobblers Garden near Apiti where the sun finally came out. We were met by Cheryl and Graeme Perkins who gave a tour and talk on the garden. The MG quiz was won by John and Viv Eames with Denise and Delina second, some of the answers showed ingenuity for sure. Leaving the garden some of the crews stopped for a coffee at the Kimbolton Cafe to finish the day. Onto S/Hwy 3 near Turakina and soon to make our first stop at the Cameron Blockhouse This timber framed blockhouse with clay walls was built in 1868 by John Cameron to protect his family from the Māori leader Riwha Titokowaru. This proved to be a well-accepted stopping point as we all pass places like this with the good intention of stopping someday. Back onto S/Hwy 3 and into Wanganui following the by-pass up to Virginia Lake for a “T” stop, then continuing out of Wanganui we turned left at the Caltex station onto Rapanui Road to Kai-iwi beach. Slight change of route here from last time, heading further west on Handley Road which runs parallel to the coast for some time and as we reached the change onto metal surface our first heavy shower came down [ dirty cars, sorry guy’s ] This road took us onto Station Road and into Maxwell. We re-grouped here before turning right onto S/Hwy 3 again and a short distance before Rangitatua Road up to Bushy Park arriving at about 12.30. Sunny and warm again we set up our chairs and table on the car park but soon scrambled for cover as the second heavy downpour hit. Most members had a tour through the Homestead and a look at the gardens and we were on the road again, this time taking Brunswick Road and Blueskin Road back to S/Hwy 3 and into Wanganui again this time stopping at Ed Boyds Auto Barn. Here was a great selection of vintage and classic cars from a Goggomobil to a Rolls Royce and everything in between. We then went to Ian’s place next door and his collection consisted of a 1906 Reo and he had made a baby one about ¼ size, a Mark 1 Zephyr convertible, a 1917 Buick and an Austin that he was restoring for a friend [see the photo’s in gallery on the Web page]. Ian also had a Model T delivery van with an organ grinder built into the back that he hand made. Anyway by this time it was around 4.00pm and the party had thinned out so it was time to get on our way home, first car all day but last out the gate. Such a great day’s motoring with no drama’s, no wrong turns and I even managed to keep on time this year. Tokaanu Thermal Run - August 2014 - a MiGhty Kiwi Road Trip! 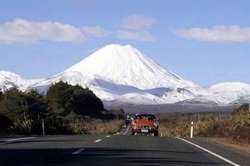 The great MG Manawatu events for 2014 keep on coming and this trip was no exception - perfect weather, fantastic roads, snow fights, hot pools, great company, awesome scenery, best cars and even a wild Stag was sighted on the Desert Road! Comments on the blog page are also confirming how good this day out was also. Check out the photos in the Gallery page also. Click on the PDF link below to read another of Sue Forde's fantastic event reports - thanks Sue! Another successful event on this year's calendar! Read the attached report by Sue Forde, who produces most interesting accounts of the groups activities and catch up what a fun couple of days this turned into! An enjoyable drive, dinner with some of our MGCC Wellington friends, beetles, guest speaker, BBQ breakfast, Cadillacs, Dodges....sounds good doesn't it? Click on the link below to read and if you have any photos to share, please send them in and remember to comment on the blog page if you wish! A very successful weekend starting with the special MG 90 dinner on the Saturday night with Gay and Bill Baxter receiving lifetime awards for their long involvement with MG in NZ and overseas. They also had the privilege of cutting the MG90 cake! On the Sunday was the "Show and Shine" where hundreds of people had the opportunity to enjoy the cars and immerse themselves in the MG world with cars from 1931 to 2014. Cars were judged on condition and the lucky winners were recognised appropriately afterwards. A most enjoyable day out with a few Manawatu members flying the flag for MG90. Read the write up below and enjoy the pictures in the gallery and do comment on the blog pages if you wish.....! From all accounts this was a fantastic weekend away - Sue Forde's great report below sums it up well in her final line "A truly awesome weekend." Make sure you have a read and relive this great motoring adventure or see what you missed out on so you can plan to be there next time! If you'd like to comment at all about Sue's in depth report or to thank the organisers or just make a general comment about the trip please make sure you do so on the blog page - there's lots of people who'd like to hear more. Also below is a link to a short video taken by Sandy Hardy which will all come to life very well once you have read the report. Great turnout for the breakfast at Spring Cafe in Feilding on Sunday. Some 30 people enjoyed a breakfast of scrambled eggs, hash browns,sausages, toast, and bottom-less instant coffee. Great value.....When we were able to tear ourselves away, it was a short drive down to the annual charity race meeting at Manfeild. This is of course not the old "Whittakers" meeting, that comes in November. That didn't detract from the quality of both the cars and the driving..... The Wellington MG Club welcomed us to their hospitality suite where a small but sumptuous lunch was available for us. It was great to catch up with Bill and Gay Baxter, part of the founding group that we now, proudly belong to. Trevor and Sandy Hardy have sent in a most interesting report of their tour of the South Island in the MG's. Sounds like it was a great trip enjoyed by all and one not to be missed next time it's on! Click on the PDF link below and read all about it! A few photos have also been added to the Gallery Page from the event. If you wish to comment at all, please remember you can do this on the Blog tab above. Otaki Forks Run - April 13 2014 16 MG's, an MGsuz and a Stag, (although its roar is always very pleasant, it wasn't BBQ material) participated on our run of the 13th April to the Otaki Forks. We started at the Feilding Railway Station for a 9.30 departure to the Arran Farm milk shop just outside Feilding where Mary & Steven Barr explained their operation and how they obtain the A2 milk they sell. This is a very well set up venture with hygiene of the highest standard. From here we meandered our way through the lower Manawatu and Horowhenua and after an approximate 2hr drive we arrived at the Otaki Forks. Unfortunately only 1 Stag could be heard but not a deer in sight when we arrived, but then the deer could probably smell the wonderful aroma coming from Bryan & Karen's BBQ and thought '' better not go too close or we may become vension patties! '' - especially with Bryan's reputation of hitting the target! Many thanks to Bryan & Karen for doing such a great job with the BBQ and the weather. Sunday 23 March was a lovely warm autumn day and 14 cars graced the MG Manawatu site.Two Jaguars were a welcome inclusion and an MGBGT from Stratford chimed in. As usual, members found lots to talk about and there was a great variety of classic vehicles to wander amongst. We gained new members on the day in Lee and Karen Taylor of Wanganui who own a red 1965 MGB Roadster and we look forward to seeing them on future runs. Thanks to all who attended. If you have any photos from this run or the show do send them to John and Viv so they can be included on the website also. A huge number of classic cars of all shapes and sizes turned out on a brilliantly fine day for this years Southwards open day. The MGCC had a prime position just inside the main gates and Pat Widdup's little 1930 MG M Type had pride of place in front of their marquee. As well as B's, Midgets, TF's etc it was great to see 3 of the 2000 RV8's built lined up together. The workshops were open with examples of their latest restorations on show - Alfa Romeo, Cord and a beautiful Bugatti Type 46 straight ﻿8. There was an amazing array of curious old cars awaiting their turn to be brought lovingly back to life. Just superb and a great day out! On Sunday 16th February we held our first run on this years’ programme. Instructions were to met at the Bunnythorpe Domain, Dixons Line at 4.15 pm. The aim was to have a short run and a social get together with a meal. A jolly bunch of people turned up and 8 cars left Bunnythorpe on the back roads to Pohangina village where we stopped for a wee minute or two. From there we hit the dust and proceeded up Finnis Road, onto Taonui Road and back down into Colyton, along to Kimbolton Road and up to Cheltenham where we ate a roast dinner at the 'Chelty'. A very warm evening and a chance to relax with a beer and have good chat ! Thanks to all - Robert.